Trust doesn't come easy for Kesh Lasota, neither does love. She must survive both, or everything she's fought for will be lost forever, including her men. The enchanting & mind-blowing Messenger series continues with more action, more romance, and more exciting twists. Add Game of Lies to your shelves today and sign up to Pippa's mailing list for all the latest news and cover reveals. It's no secret I'm a Pippa DaCosta superfan and I loved everything about Shoot the Messenger so I was ridiculously excited for this sequel and I'm very happy to say I wasn't disappointed. 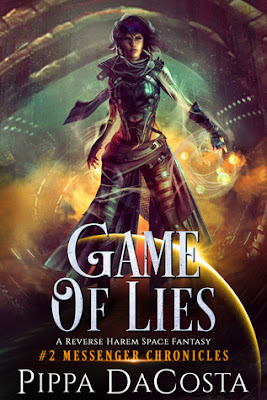 Game of Lies took everything I love about this series and ramped it up to a whole new level. Secrets, hidden identities, forgotten memories, simmering sexual tension, distrust, uneasy alliances, wicked enemies, questionable friends, it all mixes together into a perfect story that will have you gripped from the very first page. It's really hard to review a series that comes with so many twists because I'd hate to give something away accidentally but Kesh and her allies are left facing an impossible enemy when they are captured by one of the most vicious fae war generals in the Halow system. The revelations at the end of the previous book pretty much destroyed the trust between Kesh, Kellee and Talen but the only way they're going to survive this mess is if they can find a way to get past that and work together once more. You can feel the tension building between all three of them but with so many secrets and lies between them they're definitely not in a good place for romance yet. We also get to meet a surprising new character who I'm really hoping will be joining the harem but I really can't talk about them without ruining a fabulous surprise so you'll just have to read the book for yourself to find out who I'm talking about! Everything about this book was epic, from the fabulous world building and to the depth of the characters. Game of Lies couldn't have a more perfect title because it is 100% a story of lies and deception, one that will take everything you thought you knew and twist it in a new direction. I can't wait to see where Pippa DaCosta takes us next because it's sure to be a wild ride!